In August 2017, USCIS announced that effective Oct. 1st USCIS would begin to phase-in interviews for adjustment of status applications (Form I-485s) based on employment. This is one of the dramatic changes in the employment-based ("EB") cases because previously only 5- 10 % of the EB adjustment applications were called on for interviews and majority of the EB cases were adjudicated on paperwork filed with USCIS. From October 2017, all employment-based adjustment of status casesmwhere the underlying petition is a Form I-140 (EB-1, EB-2, and EB-3) that are filed on or after March 6, 2017, are subject to an interview. applications and may give the EB applicants a stomach flip. However, if you are well prepared and practice potential Q &A's before the interview, based on truthful information, applicants would feel confident and not be surprised at the interview. Where everything goes well at the interview, the applicant may get the positive results 1-3 weeks after that. Since the interview notice is normally mailed about 30 days before the actual interview date, most of applicants without serious issues will have sufficient time to prepare for the interview. Biographic Information, including history of employment and addresses. If the interviewees answer differently from the filled-out information on the Forms which were submitted, the officer will further inquire about the inconsistent items. If the information has been updated after submission of the applications, it would be wise for the applicants to add a simple comment that the information s/he is answering has been updated after submission of the applications. applicable, original marriage certificate and child's birth certificate. If copies were submitted, applicants should prepare original documents thereof and present them to the officer, when asked. Also, please make sure to bring original expired and current passports, EAD card(s) or combo (work authorization and travel permit) card(s) issued by USCIS with you. If married, the applicant and spouse must gather and bring the bona-fide marriage documents in order to prove that they entered into the marriage in good-faith. Since the spouse is getting a green card based on the marriage to the principal applicant, the bona fide marriage relationship is likely to be questioned. Especially, when they got married while the principal applicant's immigration case was being processed and the newly married spouse was included in the green application, the officer will more focus on whether their marriage is bona-fide or a "sham marriage" in which the parties of a marriage entered into the marriage solely for the purpose of falsely acquiring immigration benefits. The couple should be able to consistently answer the questions about their relationship, such as when and how they met, how long and how they dated, who/when/how proposed to a marriage, their special occasions, the information on each other's close family. 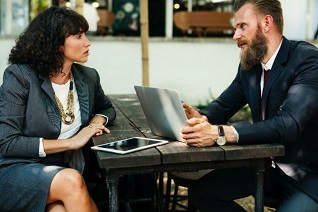 Even if the two people are married in good faith, they might forget about specifics or might tell the different stories, times, reasons when they are asked unexpected personal questions at the tense interview situations. In fact, there was a case where an applicant gave a wrong answer to a simple question like his address because he was extremely nervous at the interview. Preparation will allow the applicants to be more relaxed and feel confident at the actual interview. To prepare for this aspect of the interview, the principal and spouse may go over their history of dating, marriage, family occasions before the interview, and bring joint documents which a married couple normally possesses together, for example, joint bank statements, joint lease or deed for the residential address they live together, pictures with each other, family and friends with short explanations, joint utilities bills, if applicable, joint car, health insurance, joint memberships, etc. In addition, the officer may inquire about non-immigrant history since the first entry to the United States, dates and places of the entries, how s/he has changed their status or whether to have applied for visas at the U.S. consulate offices overseas. If you have attended school in the U.S., the school records could be asked to verify whether the applicant has actually attended the school or has not engaged in unauthorized employment while enrolling with the school. Finally, be familiar with the questions from the Form I-485 questionnaire section. Depending on the officer, usually officers ask several randomly picked questions from the questionnaire or some officers even go over all questions. Listen to the questions carefully and answer each question clearly. If your answer is yes to the question, such as "have you even been arrested, cited, charge, or detained for any reason....", applicant should prepare for the explanation on the situation and documentation thereof. The guidance in this blog is only general in nature and should not be construed as legal advice.